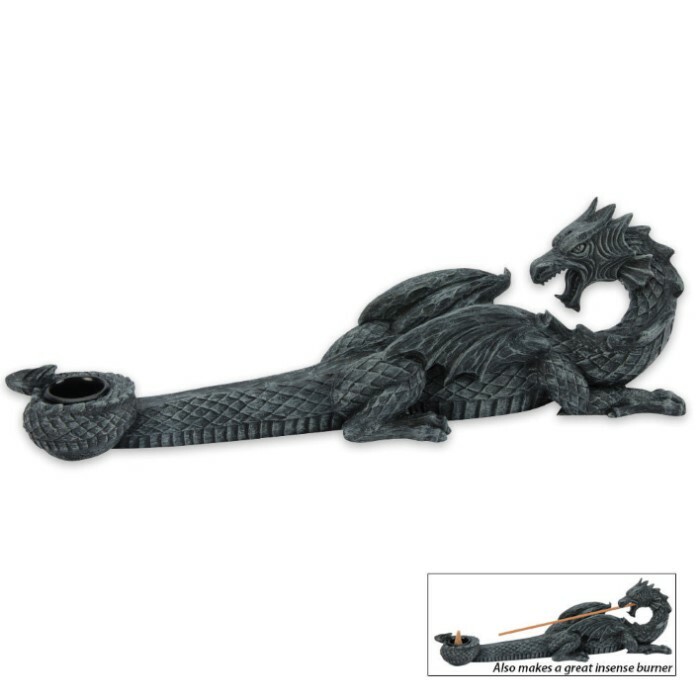 Liven up your room with this highly detailed Dragon decor incense burner! Crafted from cold cast resin and hand painted, this piece is compatible with both common forms of incense. Approximately 12 in. overall. I collect dragons and so does a friend so I bough one for her also. I am going to insert a red votive candle glass into the tail to turn it into a pencil holder for her desk. It should look like the dragon is holding fire with his tail. Super Cool incense holder. This is remarkably well crafted. All my friends want me to order them one. It does the trick alright. Not bad too look at. This item is pretty good. The dragon, however, can only hold at least 1 incense at a time, and the incense actually goes at the top of the dragon's head. Overall, I thought it looked pretty cool. I actually got it for my grandma! Hah.